Oh yes, you read right. 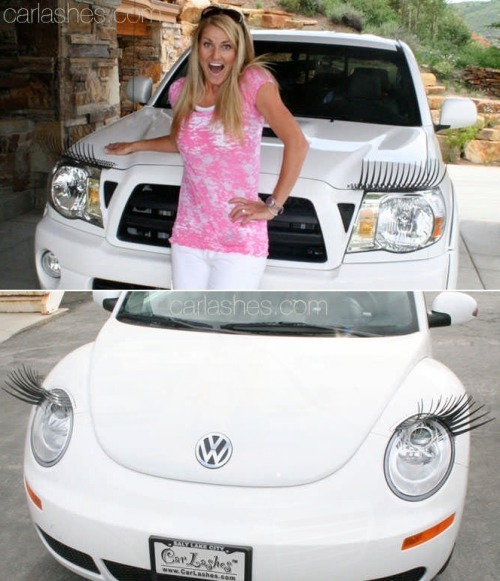 Eyelashes for your car. I follow a lot of blogs on Tumblr. One of my favourites is The Daily What. It's a whole mixture of cute videos, memes and really strange finds. The girl reminds me a bit of Elle (All That Glitters), I'm sure she'd promote these if she had the chance. So what do Carlashes™ say about this product? Carlashes™ eyelashes and crystal eyeliner are the newest hot products for your car. The trademark Carlashes™ is a new automotive aftermarket brand created to allow cars to be personalized with a feminine touch. Carlashes™ are sold by Turbo Style Products, a new company formed in January 2010 and based in Park City, Utah. Turbo Styles mission is to be THE leading supplier of female automotive aftermarket products. They've got patent pending, though I'm not sure they'll need it. I mean who in their right mind would buy these?